I would like to invite you to enjoy my home, an unforgettable spot that offers you the best of Porto city! This is my newest bet on short term rental but I'm an experienced host in Homeaway with excellent reviews, if you want to check please look for my other property 899653. If you like to experience unique places this's the place for your stay in Porto! Have you ever imagined being in bed and enjoying Douro River view with its boats and sailboats? Come live in a historic building with hundreds years, a place full of history, at the heart of Historic Centre of Oporto, classified as World Heritage Centre by UNESCO! Luxurious home in a prime location! 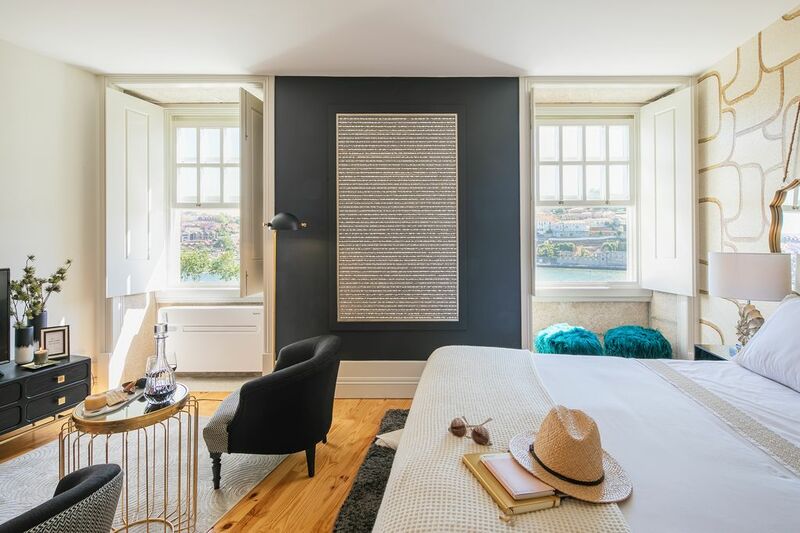 My loft is a open space composed by a bright living space bathed in sunny light overlooking the gorgeous Douro River life with a open suite and modern kitchen. At suite you'll find a Queen size bed (160cm by 200cm), upscale mattress and comfortable sophisticated bedding. Fully equipped kitchen with magnificent marble counters and top kitchen appliances of the highest quality! Located on 2nd floor, without lift, apartment benefits from a exclusive light and you're invite to enjoy exceptional sunrise by morning at breakfast and a gorgeous sunset while tast a Port wine! Reversible air conditioning to ensure the pleasant comfort you deserve, whether your stay in summer or winter! All in my home is prepare to provide you an amazing experience, hope you love my place as much as I love it! Since I was a little girl, my dream has always been to travel all over the world, luckily, I met half a world! Now I want to be part of your dreams, as guests traveling to know this wonderful city, provided you a truly unforgettable experience! This is my newest bet on short term rental but I'm an experienced host with excellent reviews, if you want to check please look for property 899653. In my most secret heart, I always dreamed living a house in old historic city center with an incredible view to Douro river, it took me years to find it but finally happened! I invite you to discover my gem!!! Fall in love for gorgeous view of waterfront Douro River in a premium home where all details are design to make your stay unforgettable!!! Reversible air conditioning to ensure all pleasant comfort you deserve, whether your stay in summer or winter! Reversible air conditioning to ensure all pleasant comfort you deserve, whether your stay in summer or winter since it heating too! Street Parking Free - There's easy parking on the street of the house. A full kitchen with fridge/freezer, ceramic hob, oven, microwave, dishwasher, sink, Nespresso machine, Kettle and toaster! An adjoining dining area with 4 seats. Breakfast on request. Airport Transfer on request. Amazing place in a wonderful city! I highly recommend staying in Isabel's apartment if you are visiting Porto for a number of reasons. First, the apartment is so well decorated and absolutely gorgeous! Isabel has done a wonderful job making this apartment super cozy and it truly feels like home when you are there. She also leaves out some Port wine and Nata -- Very generous of her! Also, this apartment is in the perfect location. It is so easy to get to a variety of neighborhoods in Porto from her apartment as well as down to the river. In fact, you have a perfect river view from the bedroom window -- It is lovely! Finally, Isabel is so accommodating in helping guests find the best restaurants and things to do while visiting. She took so much time to explain to my mother and I about her favorite spots to visit and look out from to take in all of the beautiful city. In addition, she made all of our dinner reservations for us before we even arrived in Portugal. It was lovely having all of this taken care of -- We really were able to simply enjoy. I also recommend asking her to set up the Duoro Valley Tour for you. It was lovely and I am so glad that my mom and I did it! The only thing to know about this apartment is that it is in the middle of a fairly large hill. If that is going to be an issue for any of your visitors, ask Isabel ways to get around it -- She has all of the tips! Isabel was a lovely host. She went above and beyond making me feel at home and helped me when my luggage was delayed. Isabel answered all of my questions and shared suggestions on things to do in the area. The apartment is exactly how it is pictured. Beautiful decor and a stunning view! The location is perfect to walk everywhere and the trolley or bus line is right nearby. I wish I had more time in Porto and I look forward to coming back! We loved Isabel‘s apartment overlooking the beautiful Douro river in Porto, one of our favorite cities, now, in Portugal. Isabell is one of the loveliest hosts we have encountered on our many trips with VRBO. She was always available for advice And she checked with us each day to see how we were doing and give us more ideas. One of the restaurants she recommended, Intrigo, was just a few steps from the apartment and overlooks the river and watching the sunset there was one of our favorite things to do. We ate there are two evenings during our stay. We also enjoyed following the walks she suggested. You must not miss this wonderful city and this wonderful apartment. Had the most fabulous stay in Porto. Isabel greeted us directly and warmly with pastries and port upon our arrival. Her local suggestions were so helpful, especially in regards to great eats. The apartment finishes and views were amazing and perfect for our honeymoon. My husband and I are already looking forward to a return. Highly recommend!! We were so lucky to find this beautiful apartment and Isabel is the most fantastic host ever! After meeting us at the airport Isabel gave us a great little mini tour of Porto before taking us to her beautiful apartment. It's so spacious, stylish and spotlessly clean and has the most luxurious bed ever! Porto is a great destination for a city break with the coast close by. The Ribeira district with all its cafes and restaurants is a short walk from the apartment. Isabel was incredibly helpful throughout our trip, nothing was too much trouble. We highly recommend this destination, you definitely won't be disappointed. Isabel was an amazing host. She met with us when we arrived and went over a map of the city and what sights she thought were important. She also sent many great recommendations for restaurants. The suggestions we tried were wonderful. The apartment is beautifully done and has a spectacular view. It is a small studio but we found it totally comfortable. As others have commented the bed was great! I wish we stayed longer and would definitely stay here again on a future trip to Porto. HEART STORIES Exclusive Homes enjoys a location in Porto, just a 4-minute walk from Palacio da Bolsa with an amazing view to Douro River!!!! ​MUNICIPAL TOURIST TAX A more sustainable Porto ​​​​​​Please note that from 1st March 2018, a Municipal Tourist Tax of 2€ per person and per night isn't included in total ​booking ​price and it should be paid on site at your arrival. Municipal Tourist Tax is charged to all guests ​aged 13 and older, up to a maximum total​ ​value of 14€ per guest (7 straight nights per overnight stay/person).